Right after the defeat of Ozai, Zuko, Aang, and King Kuei of the Earth Kingdom, start making plans for removing the Fire Nation colonies from the Earth Kingdom. Zuko makes Aang promise that if Zuko were ever to lose his way, Aang would end him for the good of the world. A year later Zuko is having trouble sleeping, as he worries about assassins. His fears are well founded, as he is attacked by a girl, who turns out to the be daughter of the mayor Yu Dao, the oldest of the Fire Nation colonies. Zuko takes the girl back to her home, where he confronts Mayor Morishita. Morishita compares Zuko unfavorably to his father, causing Zuko to flashback to an extended version of the scene where he confronts his father. Aang later gets news, while taking Fire Nation colonials back to the Fire Nation, that Zuko has removed his support of the Harmony Restoration Movement. When Aang confronts Zuko, Zuko explains how he learned about the Fire Nation colonials and the Earth Kingdom natives in Yu Dao had become so entwined that removing the Fire Nation colonials would destroy families and the city itself. Katara wonders if perhaps Yu Dao could be an exception. Aang and Zuko agree to meet with King Kuei to discuss the matter. Later, when Zuko returns home, Mai confronts him about not letting her know when he left for Yu Dao. She tells him that she contacted the Kiyoshi warriors to provide him with proper body guards. Later that night Zuko still wakes up in a cold sweat, afraid of assassins. Despite the assurances of Suki and Ty Lee, Zuko can’t shake the feeling that someone is coming after him. He goes for a walk, to meet with his father, who he asks for advice. I’m not a fan of graphic novels based on TV series. In fact, I’m not a huge fan of any kind of graphic novel based on anything. I stick firm to my opinion that the original is always better than any adaptation. However, when a graphic novel isn’t an insultingly obvious cash-in and it’s actually well written and well drawn, then I just might be able to ignore my prejudices. The Promise is one of these comics that I can not only tolerate, but actually enjoy. The main reason for this is because this book deserves to exist. With the release of The Legend of Korra we are left with a seventy year gap, and no knowledge of how we got from the ending of Avatar: The Last Airbender and The Legend of Korra. There are seventy years worth of stories to be told here, more than lucrative territory for new ground to be covered. The Promise covers the start of the creation of Republic City. And while this answers the most urgent questions, I’m excited to not only see the rest of the story, but what else comes out in the future. As far as The Promise Part 1 is concerned there is a surprising amount of material for a graphic novel. I mostly breeze through the average graphic novel pretty quick, and this first volume provided enough to give me a good half hour of reading. It has good rereadability, which helps the wait between now and the release of the second volume. The art looks very much like the series, without looking exactly like the series, like those awful comics that just take screen shots of the series/movie and add speech bubbles. Comics like that tend to end up looking stale, but (insert name of artist)’s style makes the comic look like something from the series, while retaining the dynamic look of good graphic novel art. The fight scenes aren’t the greatest, they aren’t abysmal, but I didn’t feel entirely engaged by them. It would be easy to say that’s because they are static images, while the fight scenes from the animated series were moving images. But that would be too much of an excuse, especially considering my personal penchant for fighting manga. It is very much possible to draw engaging fight scenes in graphic novel format. (Insert name of artist) divorces the individual panels from each other during the fight. There is no clear progression between one stance to the next. Most of all, the biggest indicator that the fights aren’t engaging is that I tend to skim over them when I read the book. My mind automatically says, “Insert fight scene here” and goes on like that until the plot starts again. Speaking of the plot, I’m enjoying what we’ve seen so far. While I am a bit skeptical about how Aang agrees to murder Zuko, if the latter ever lost his way, when he’d just refused to murder the person who was ready to burn the entire world to the ground. If Zuko tries to do the same thing, just do what you did to Ozai and take his bending away! While I can accept Aang accepting the promise, hoping it never comes to that, I don’t quite think it fits with his character, especially after the fuss he brought up when time came to kill Ozai. The most interesting thing in this volume is the introduction of Mayor Morishita and his family, while the daughter is a twit who by all rights should have died during that moronic assassination attempt. I appreciate the idea that the inter-marriage between Fire Nation and Earth Kingdom citizens is what started the movement towards the United Republic of Nations. It introduces a more mature worldview that the series has not had before. Personally I find it a more sensible world view. Keeping the nations separated is more damaging than good, which is what I believe The Promise is going for. Rather than balance it will be unification. Zuko’s turning to his father for advice may strike some as out of place, but since we have yet to see where that plot thread goes I’ll hold off on judging it. The build up towards it was satisfactory, in my opinion. Zuko is clearly under a lot of stress, and the lack of sleep is driving him to the end of his line. He knows he needs help, and the only person he can turn to is the man who ruled the Fire Nation before him. 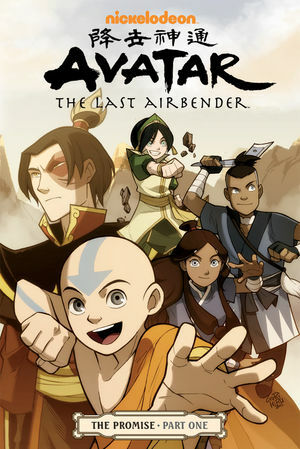 In the end, I judge this mini-series as superior to the other Avatar: The Last Airbender comics. Most of them have been one shot stories, comedy more often than not. In my personal opinion I’m more interested in finding out what happens after the series ends, rather than some random stuff that happened in between that may or may not be canon. Graphic Novels are a great way to continue the story, especially if enough care is put in to make it look like the show itself. I highly recommend this first volume to anyone that loves Avatar: The Last Airbender. Previous Post:Anime Reviews: Medaka Box Episode 01 – Why Not?